If you have any information about these crimes or any person(s) involved, you are urged to call Crime Stoppers or submit a Web Tip from this website. You do not have to give your name. CRIME STOPPERS will pay a cash reward of up to $1,000 and you can remain anonymous. Black or mixed race male (pictured) robbed the US Bank located in the Lunds/Byerlys on County Road C in Roseville just west of Snelling on Monday, November 14, 2016 at about 7:00 p.m. After declaring he had a bomb the clerk gave him an undisclosed amount of cash. 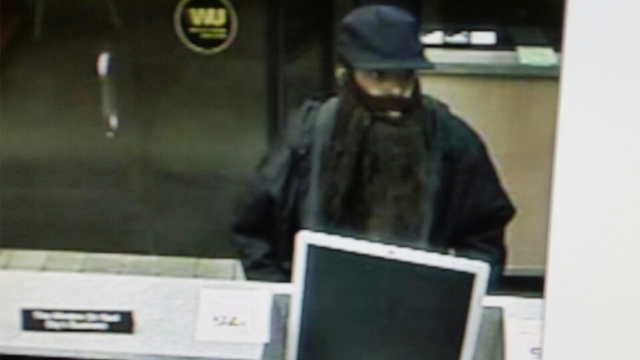 Suspect was wearing a green `poofy` winter coat, baseball cap and phony beard and mustache. On January 8, 2016, an unknown suspect robbed the Guaranty Bank located in the Cub Foods at 1201 Larpenteur Avenue West in Roseville, Minnesota. The suspect entered the bank, presented a demand note, and received cash. He then departed the bank, entering the passenger side of a waiting vehicle. He was wearing a brown jacket with a hood, black gloves, black pants and black shoes. If you have information about this suspect (pictured) or his accomplice driving the car you can come forward and remain anonymous from this website. On Friday, November 30, 2012, at approximately 11:42 a.m., a bank robbery occurred at TCF Bank, located at 6501 Richfield Parkway, Richfield, Minnesota. The robber approached a bank teller, provided a note, and demanded cash. No weapon was displayed. After receiving an undisclosed amount of cash, the robber fled on foot. 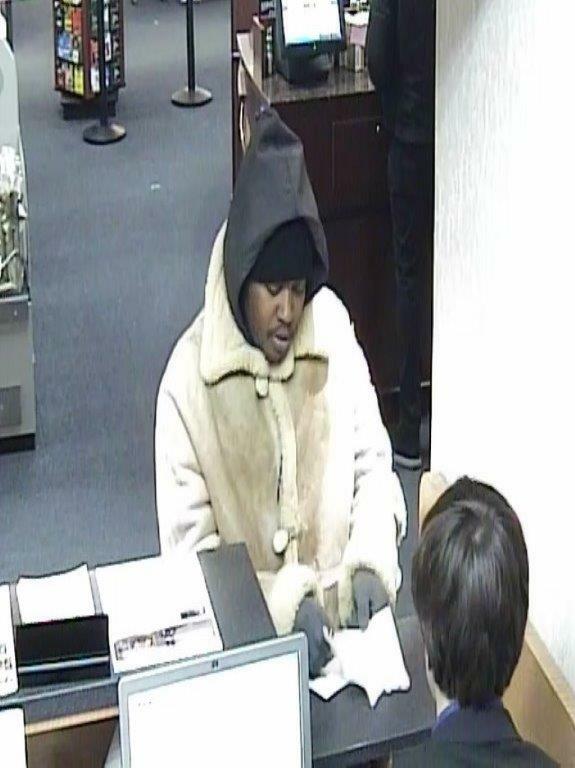 The robber (pictured) is described as an African-American male, dark complexion, approximately 5’10” tall, 185 pounds, approximately 40–50 years old, wearing a dark, waist-length coat; dark jeans; dark-rimmed glasses; and a dark knit cap. The FBI is offering a reward for information that will lead to an arrest of this robber. If you know this person or where he can be found you can come forward to Crime Stoppers of Minnesota and remain anonymous. You can Help Solve This Crime! Since March 26, 2012, there have been six related bank robberies in which the subject used similar mannerisms of displaying a pistol in his right hand and wearing a fake nose, fake facial hair and appearing to be wearing tan makeup. 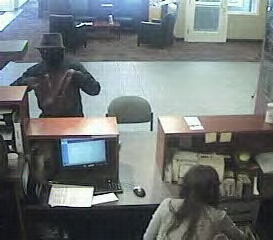 The robber frequently wears a gray, black, or tan fedora-style hat; tan derby-style hat; and/or a baseball cap. The robber frequently dresses in business suits with French cuffs and cufflinks. For the most recent robberies, the robber dressed less formal. The robber (pictured) is armed with a black/silver pistol. The robber, who is pictured is further described as follows having a light complexion and a medium build. He is believed to use a red Ford Mustang convertible with a light or tan top, five spoke rims and with the word “Mustang” on the bumper. Another possible car use by him is a light-colored, two-door, mid 1990s Ford or Buick with possible primer paint on the passenger side door. 3. Friday, April 27, 2012: Guaranty Bank, Rainbow Foods, 10200 6th Ave. N. Plymouth MN. The FBI has dubbed this suspect the Fedora Nose Bandit and seeks your help in identifying him and where he can be found. By clicking here you can HELP SOLVE THESE CRIMES and remain anonymous. On Monday, July 9, 2012, at approximately 10:32 a.m., a bank robbery occurred at the Guaranty Bank location inside the Rainbow Food Store at 8020 Brooklyn Blvd. in Brooklyn Park, Minnesota. The robber confronted the bank employees and while keeping one hand concealed in a dark colored backpack, gestured as if he had a weapon. After receiving an undisclosed amount of cash, the robber fled the bank on foot. The robber is believed to have fled towards the Brooklyn Park Evangelical Free Church, located at 7849 W. Broadway Avenue in Brooklyn Park. 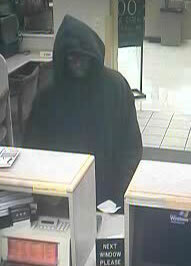 The robber (pictured) was described as a black male, 5’5” to 5’6”, approximately 20-35 years old. He wore a white T-shirt, gray sweatpants, an orange baseball cap, and purple rubber gloves. The robber carried a dark-colored string backpack. If you have any information about this suspect and where he can be found you can come forward anonymously and help Solve This Crime. On Monday, July 9, 2012, at approximately 10:14 a.m., a bank robbery occurred at the TCF Bank branch located at 5018 France Avenue South in Edina, Minnesota. The robber confronted bank employees and demanded money. After receiving an undisclosed amount of cash, the robber fled the bank on foot. The robber is believed to have used the public parking structure located at W. 51st Street in Edina, Minnesota, for his escape. The robber (pictured) was described as a white male, 5’6” to 5’8”, 140 -160 lbs., wearing a black wind breaker, black fedora hat, black sunglasses, black scarf, black jacket, black gloves, tan pants, and black shoes. On June 25, 2012, at approximately 12:00 p.m., a lone white male entered the Woodland Bank in Hill City, Minnesota. 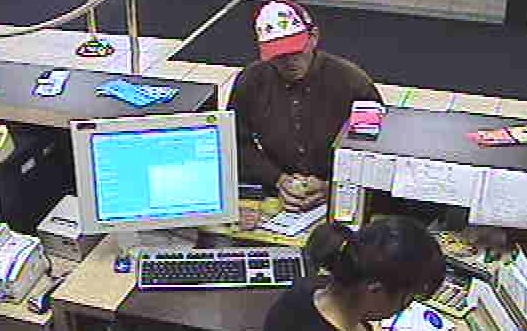 He approached the teller counter with a handgun pointed at bank employees and demanded cash. After obtaining an undisclosed amount of U.S. currency, the robber fled the bank. The robber was described as a white male, approximately 6’2” in height with a muscular build. 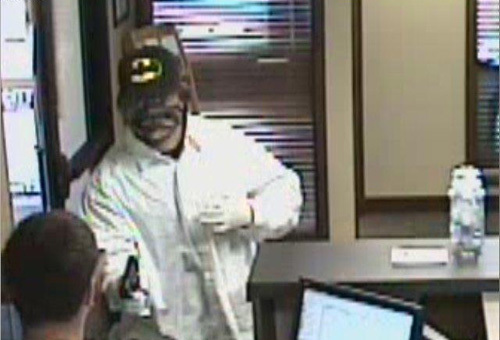 The robber wore a black baseball cap with a yellow and black “Batman” emblem. He also wore a white, long-sleeved shirt, khaki pants, sunglasses. He wore a bandana over his face. The robber is also believed to have a stolen a green 1997 Pontiac Grand Am, license plate number XAT 113, automobile from Calumet, Minnesota. The automobile was recovered a few miles from Hill City at approximately 5:00 p.m. on June 25, 2012. If you know this suspect or where he can be found you can help Solve this Crime and remain anonymous. 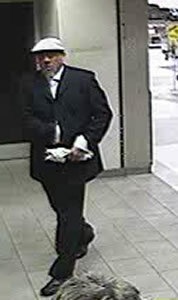 On Friday, May 18, 2012, at approximately 11:00 a.m., a bank robbery occurred at the City County Credit Union located at 144 E. 11th Street in St. Paul, Minnesota. The robber approached a bank teller and displayed a note demanding money. After receiving an undisclosed amount of cash, the robber fled on foot. The robber (pictured) is described as a male, approximately 40 years old, approximately 5’8” tall, approximately 140 pounds. He was wearing a red and white baseball cap, brown shirt, blue jeans, and white tennis shoes. On Wednesday, May 9, 2012, at approximately 1:50 pm, an unidentified male robbed a TCF Bank branch located inside the Cub Food Store at 3717 Lexington Avenue North in Arden Hills, Minnesota. 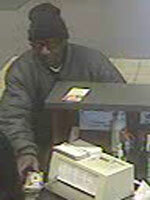 The robber (pictured) approached the teller counter and presented a note demanding cash. The victim teller complied with the robber’s demand and provided an undisclosed amount of cash to the robber. The robber departed the area on foot. The robber was described as a white male approximately 5’8” in height and weighing approximately 165 lbs. 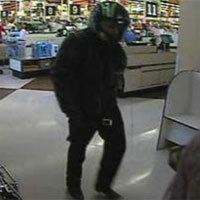 The robber wore a black motorcycle helmet and a black leather jacket. On Friday, April 27, 2012, at approximately 11:45 a.m., an unidentified male robbed the Guaranty Bank located inside the Rainbow Food Store at 10200 6th Avenue in Plymouth, Minnesota. The robber approached the teller counter, placed a black bag on the counter, and displayed a handgun. He then ordered the victim teller to fill the bag with money. The victim teller complied with the robber’s demand and filled his bag with an undisclosed amount of cash. The robber departed the area on foot. The robber was described as a black male with a light complexion; approximately 6’0” to 6’2” in height, and having a medium build. The robber wore a gray business suit, a white-collared shirt, and a cream-colored Fedora. On Monday, March 26, 2012, at approximately 11:20 a.m., a bank robbery occurred at a Wells Fargo Bank branch located at 16401 County Road 30, Maple Grove, Minnesota. A lone male, described as having tan or olive skin, entered the bank and displayed a handgun while approaching the teller counter. He orally demanded cash from the victim teller. After receiving an undisclosed amount of cash, the robber fled from the bank. The robber (pictured) was described as a male who stood approximately 6’0” in height and weighed approximately 200 pounds. He was also described as having dark eyes and hair and was wearing a Fedora hat and dark clothing. On Wednesday, November 16, 2011, at approximately 5:10 p.m., a bank robbery occurred at a TCF Bank branch in a Cub Foods store, located at 2850 S. 26th Avenue in Minneapolis, Minnesota. The robber entered the store, walked over to the TCF Bank area and wrote a demand for cash on a deposit slip. After waiting in line with other customers, the robber handed the note to a teller and displayed a handgun. After obtaining an undisclosed amount of cash, the robber fled from the store. 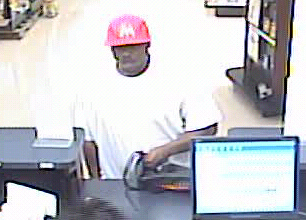 The robber (pictured) was described as a black male, who was in his early 20s. He stood approximately 6’ in height and weighed approximately 180 lbs. The robber wore a black hooded sweatshirt, dark, “aviator style” sunglasses, and dark pants. If you have any information regarding the person committing this robbery you can come forward...remain anonymous...and may qualify for a reward. Please help Solve This Crime. On Wednesday, February 9, 2011, at approximately 11:48 a.m., the InterBank branch located at 1875 County Road B2 West in Roseville, Minnesota, was robbed by two masked men. The two robbers (pictured) ran through the parking lot and into the bank. One of the robbers approached a female bank employee and put a silver semi-automatic handgun to her neck. The robber ordered her to open a safe. The robber told the teller that he did not want any “funny money.” There were two other bank employees in the bank at the time. The employees opened the safe and the robbers obtained an undisclosed amount of cash from the safe. The three victims were then locked in a closet before the robbers fled the bank with their robbery proceeds being carried in a dark colored backpack. One robber is described as a black male, about 6’0” tall with a large build, wearing a black ski mask, black jacket and pants, black gloves, and a white wool ski cap. He carried the silver handgun in his left hand. The other robber is described as shorter than the first robber, a skinny build, believed to be in his 20s or early 30s, wearing a black ski mask, black clothing, gloves, and white sneakers. He carried the dark colored backpack. The robbers are believed to also be responsible for the robberies of the Wells Fargo Bank in Champlin on August 4, 2010; the U.S. Bank in Plymouth on September 13, 2010; and the U.S. Bank in Anoka on November 5, 2010. They are also believed to be responsible for attempted robberies at the TCF Bank in Chanhassen on August 30, 2010 and the TCF Bank in Lakeville on September 2, 2010. U.S. Bank is offering a a separate reward of up to $100,000 for information leading to the arrest and conviction of the individuals responsible for these robberies. If you have any information about who these suspects are and where they can be found you can help Solve This Crime. On Friday, May 25, 2012, at approximately 12:30 p.m., a bank robbery occurred at the TCF Bank branch located at 1186 W. Broadway Street in Forest Lake, Minnesota. The robber approached a bank teller and displayed a note demanding money. After receiving an undisclosed amount of cash, the robber fled northbound on foot. The robber is described as a male, approximately 40-50 years old, 5’8” to 5’10” in height, approximately 220 pounds, and wearing a black bandanna, mirrored sunglasses, and a black leather jacket.